Focal length is a number that is vital to photography and photogrammetry but often misunderstood. A strict technical definition of focal length is difficult without providing a lot of background in lens theory, so we will use a simplification. You can think of focal length as the distance between the imaging plane (e.g. the image chip in a digital camera) and a point where all light rays intersect inside the lens (the ‘optical center’). 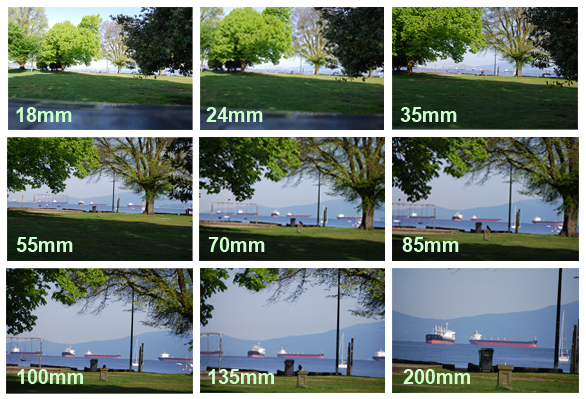 So a focal length of 20mm means that the distance from the optical center to the imaging plane is 20mm long (about ¾ of an inch). What does the focal length number mean? A camera typically has focal length in a range of 10mm to 500mm. Different types of camera can have different ranges and speciality lenses can extend outside this range as well. A 10mm focal length would be a very wide lens (capturing a lot of the scene), and 500mm would be a very narrow lens (capturing only a small part of the scene – giving a large magnification like binoculars or a telescope). Cameras can have fixed lenses (sometimes called ‘prime’ lenses) which have just one focal length, or zoom lenses which allow the focal length to be varied (for example between 18mm-55mm, or 55mm-200mm). For high accuracy photogrammetric work in PhotoModeler, a fixed (or prime) wide lens (such as a 20mm lens on an APS-C frame camera) is recommended as the primary option, but different applications may require different focal lengths, and cameras with adjustable zoom lenses can still be used to achieve very good results with some extra procedural care over the focal length. Note: A technical photogrammetry term that you may come across is the “Principal Distance”. Strictly, the Principal Distance is the distance mentioned above (i.e. distance from imaging plane to the lens optical sensor), and the focal length is the principal distance when the lens is focused at infinity. See below for more information on focus vs focal length. When PhotoModeler lists focal length for a camera, it is actually the Principal Distance that is shown. When you buy a digital camera you will often see the specification “equivalent 35mm focal length”. What does this mean? Most digital cameras have imaging chips that cover much less area than a standard 35mm film frame. Since 35mm film cameras were the standard for so long in photography, much of the techniques and methods were developed around them. A 35mm film camera has a negative that is about 36mm wide by 24mm high (the “35” comes from the physical width of the film stock that is exactly 35mm wide). A ‘normal lens’ (has a field of view that appears ‘natural’ to humans) on a 35mm film camera has a focal length of 50mm. Modern digital cameras can have imaging chips that are as small as 6mm by 4mm; some Smartphone cameras are even smaller, and then up to full 24mm by 35mm size. A very common size is the APS-C format at 16mm by 24mm. This smaller size affects what is considered to be a ‘normal’ focal length. Let’s say you take a picture of an automobile with two cameras, a 35mm film camera and a smartphone camera. You stand in the same spot and take two photos, one with each camera. In both cases you want to take a photo of the automobile that fills the frame. If the 35mm film camera lens has a 50mm focal length, the digital camera’s focal length might be 4mm. So even though they are very different numbers they produce the same result because of the size of the imaging surface. So the “equivalent 35mm focal length” for this smartphone camera at 4mm is 50mm. Camera manufacturers sometimes list these equivalents because some photographers are more familiar with 35mm cameras and they want to make it easier to understand. It also gives us a standard of reference for all the different format sizes. They may also list the multiplier factor. For example, the APS-C multiplier is around 1.6x. So a 32mm lens on an APS-C camera (like the Nikon D3200) would act like a 50mm lens on a 35mm film camera. Does focusing affect the focal length? Above we mention that focal length is related to focus distance. Focal length is the principal distance of a camera when it is focused at infinity. In photogrammetry we are interested in the camera’s internal geometry at the time photos were taken – so it is the principal distance that we want to know precisely in photogrammetry. The answer is ‘yes focusing a lens changes its principal distance’. All lenses have a stated or specified focal length value (or range of values for a zoom lens). This printed number is actually its nominal length or the principal distance when the lens is focused at infinity. As you focus on objects that are closer to the camera, the principal distance changes. So for example, a 50mm lens focused on an object a few feet away might have a principal distance of 55mm lens at that time. The most extreme example of this is with a macro setting (a lens setting that allows you to focus on very close, very small objects, under 5″ in size for example). A lens that has a 50mm nominal focal length (so a 50mm principal distance when focused at infinity) might in fact have a 100mm principal distance when focused at a few inches! This is why it is good with photogrammetry (where precise geometry is needed) to calibrate a camera at the distance you will be working with. There is some ability to calibrate a camera (which solves the principal distance) at one focus and execute your photogrammetric project at another focus. The actual discrepancy that is acceptable depends on your accuracy requirements and how much the focus changes. Generally a calibration done at 2m/6ft focus distance is acceptable for projects up to infinite focus (again depending on accuracy requirements), but may not be acceptable for a project where the focus distance was 50cm/20in. In many cases though, the advantages of using focus (i.e. crisp targets and distinct features) with subtle effects on principal distance/focal length, outweigh the advantages of keeping focus and principal distance constant (i.e. potentially causing blur in some photos taken at a different distance). PhotoModeler needs to know the principal distance of the camera/lens at the time the photos were taken so that it can solve geometry and calculate the camera positions and create 3D coordinate points. This means a) calibrate the camera to establish the exact focal length/principle distance for more accuracy (or at least use a reasonably close focal length estimate), and b) if using a zoom lens, take photos with the camera set at the same focal length (zoom setting) at which the camera was calibrated (for repeatability, use the widest angle or fully zoomed). The format size and the focal length are both important. Knowing just the focal length is not enough. PhotoModeler has four methods for calculating the focal length/principle distance and the format size. These are a) Camera Calibration, b) the quick Approximate Camera method using the images’ EXIF header, c) the Inverse Camera method (for projects using photos from an unknown source), and d) Field and Auto Calibration (which is camera calibration executed at the same time as the modelling project). For the most consistent and accurate project results, calibrate your camera and then always use it at the same focal length that you calibrated it at. PhotoModeler is one of the leading tools for photogrammetry (the science of generating measurements and accurate 3d data from photography).